How much time are you willing to out into this project? Most employers would insist that any work be done after hours, which will impact your personal time management. A simple display that utilizes moderate light, and slow to moderate growth plants will need only minimal attention. A sealed top aquarium hood with a glass cover inside separating the lights from the water will slow down evaporation. How close is your office to a sink or source of water? Accidents do happen...at least to me they do! I have had leaky filters, I have connected filter hoses incorrectly and emptied water onto the carpet, marred furniture, had Python water changers turn into a water fountain, spilled chemicals...OK, I am a clutz! But I put up with it at home, learn from my mistakes, and deal with it. At the office though I do not want to become liable for my mistakes! New carpets and furniture are expensive! To create an interesting aquascape in small tanks, it is important to keep the right scale in mind. This requires using SMALL plants, tight groups, and as in any size tank, varying heights for perspective. Stem plants can be used as background plants, and most can be trimmed and kept to any desired height. Plants with small to minature size leaves would work the best, while those with very long leaves would look to overpowering. For grass like plants, most any type of Vallisneria should be avoided, except perhaps corkscrew vals in ten gallon aquariums. Dwarf sag. and Pigmy Chain Swords, ( E. tenellus, latifolious ) can reach heights of 6": to 8" - almost a background plant in very small tanks. Micranthemoides , (baby tears) is a perfect plant for small tanks with its tiny tiny leaves! It can be grown in groups, "bushes", or carpeting a whole area, kept short or tall. Of course this requires much pruning. 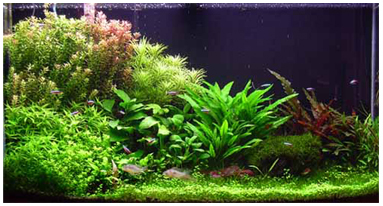 Other suitable plants would include Java moss, small Cryptocorynes, and Anubias nana , which would be lower maintenance plants, not requiring frequent pruning.